A fleuk is a member o the order (Pleuronectiformes) o ray-finned demersal fishes, an aa cried the Heterosomata, sometimes classified as a suborder o Perciformes. In mony species, baith een lie on ane side o the head, ane or the ither migratin through an aroond the heid durin development. Some species face thair left sides upward, some face thair right sides upward, an ithers face either side upward. Mony important fuid fish are in this order, includin the flounders, soles, turbot, plaice, an halibut. Thare are ower 400 species. 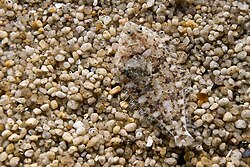 Some flatfish can camouflage themselves on the ocean fluir.